We know that German Shepherd breeders are a dime a dozen, and that good breeders are as easy to find as poor ones. One of the many things that sets us apart from the crowd is devotion to puppy raising. At Austerlitz Shepherds we practice passionate puppy raising. We devote ourselves fully to raising each and every puppy in our care. Every litter has two full time puppy raisers, Susanne and Rebecca, both experts in training, behavior, and early puppyhood development. We work tirelessly to ensure our puppies benefit from the excellent genetics they inherit. We understand completely that our hard work creates lasting benefits to the behavior and health of every dog we place. Here is a short breakdown of just what you get when you join the Austerlitz Shepherds family. Puppy Culture Raised Puppy: We are very proud to be one of the first breeders to embrace Puppy Culture. We knew upon first exposure that Puppy Culture would improve our already rigorous puppy raising protocol, and we have been joined by some of the best breeders in the world because Puppy Culture has fast become the Gold Standard in puppy raising. Once puppies are born, their genetic inheritance is set, and our work making the most of each puppy’s potential begins. From early neurological stimulation, emotional stability exercises, teaching puppies to communicate needs politely, handle frustration with aplomb, early positive crate training, and early toilet training, Puppy Culture builds a calm, confident, and adaptable puppy that is a pleasure to add to your family. 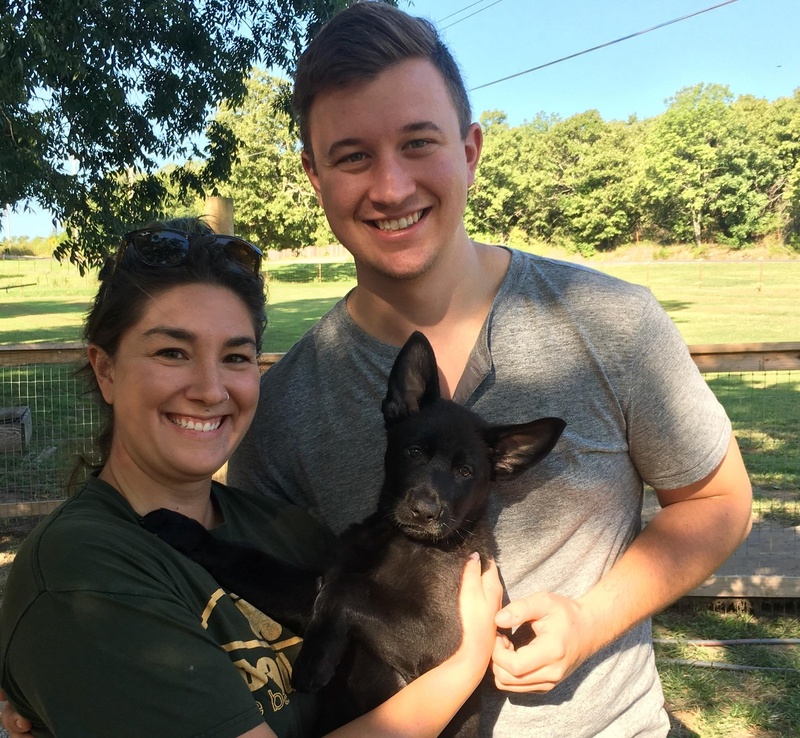 Training: Our professional trainers start teaching puppies life skills like Manding (asking politely), toilet skills, crate skills, and how to settle down. We also introduce basic training skills like sit, down, hand target, attention, leash walking, and coming when called. 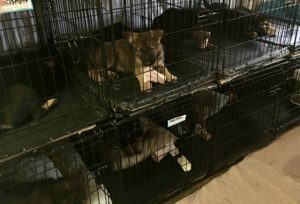 Crate Conditioning: The Crate Conditioning protocol we designed is so popular we now teach it to other breeders, fosters, and new puppy owners all over the world. We introduce crates early, condition puppies to see their crate as a wonderful place to be, play lots of crate entry games, and build tolerance to confinement. We teach puppies early that crates are a safe place to enjoy their favorite things. This will help make transitioning to your home less stressful for everyone. 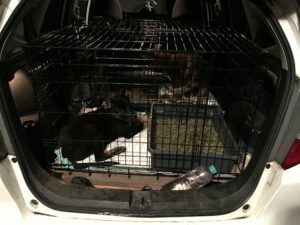 Early crate conditioning prepares puppies to grow into dogs who are calm and confident when crated even away from home at trials, shows, or when traveling with your family. Car Conditioning: Puppies are socialized to vehicles. They learn that vehicles are fun to climb into, fun to play in, and safe enjoyable places to relax. Puppies receive several vehicle exposures, including at least 1 hour in actual driving time. This prepares your puppy to be a confident and happy traveler that can easily accompany you to shows, trials, or for long family trips. Just Long Enough: We keep our puppies a minimum of 9 weeks and a maximum of 10 weeks. 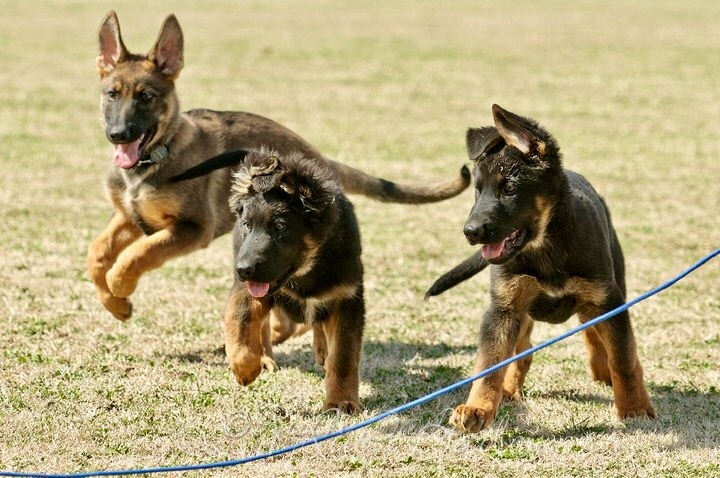 German Shepherds often experience a strong fear imprinting period around 8 weeks. This makes placement at 8 weeks riskier for long term behavioral health than placement after 9 weeks. However, it’s important for a GS puppy to be socialized in it’s new environment prior to the end of the critical socialization period around 12 to 16 weeks. By placing in that golden window between 9 and 10 weeks you avoid the risk of transitioning during a fear imprinting period, yet the new family still has several more weeks during the Critical Socialization Period to socialize your puppy to your own individual lifestyle. Sure, this is more work for us, but with the help of Puppy Culture, our crate conditioning, and toilet training protocol, we are able to make the most of this extra week. New owners benefit from a slightly more mature puppy with more training, crate, and toilet skills. Argent and Snapdragen all loaded up and ready for a road trip to their new homes in Ohio. 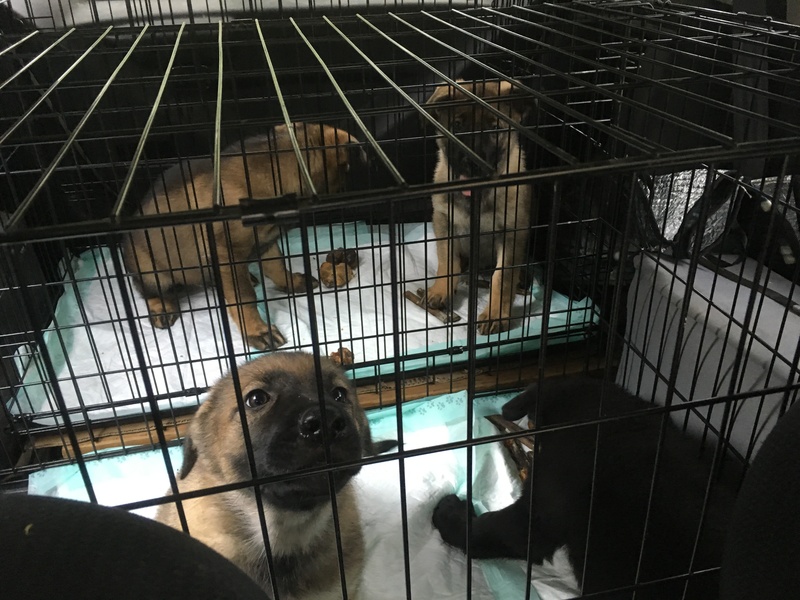 Pick up or Delivery: In the best interest of our puppies, we do not ship puppies as “cargo” on airplanes. We prefer you pick your puppy up in person, meet us and your dog’s relatives, and attend our puppy raising seminar on Puppy Pick Up Day. When this is not possible, we can meet you half way, or deliver your puppy to your door. This protects both the behavioral and physical well being of your puppy. 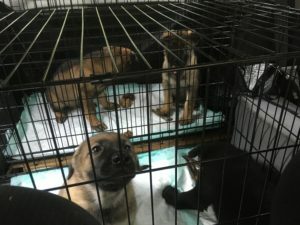 Education: Free access to our Passionate Puppy Raising and German Shepherd Dog Network Facebook Groups: Here you will benefit from a plethora of information to help you raise and train your puppy. Weekly educational Units on a variety of topics, demonstration videos, product suggestions and reviews, and Live question and answer sessions mean you get real time, individual, expert support as you raise your puppy into the adult dog you have always dreamed of. This subscription based group is open to puppy owners of all ages and breeds, and is provided free to our members your 12 month subscription fee is included in your purchase price. Community: A lifetime of advice, support, and encouragement. We maintain regular contact with our puppy families through our family of Facebook Pages and Groups: Austerlitz German Shepherds Facebook Page, Clickety Split Dog Training, Passionate Puppy Rasing FB Group, the German Shepherd Dog Network, and other groups of interest such as Puppy Culture Discussion Group, and Positive Reinforcement Breeder Support Group. 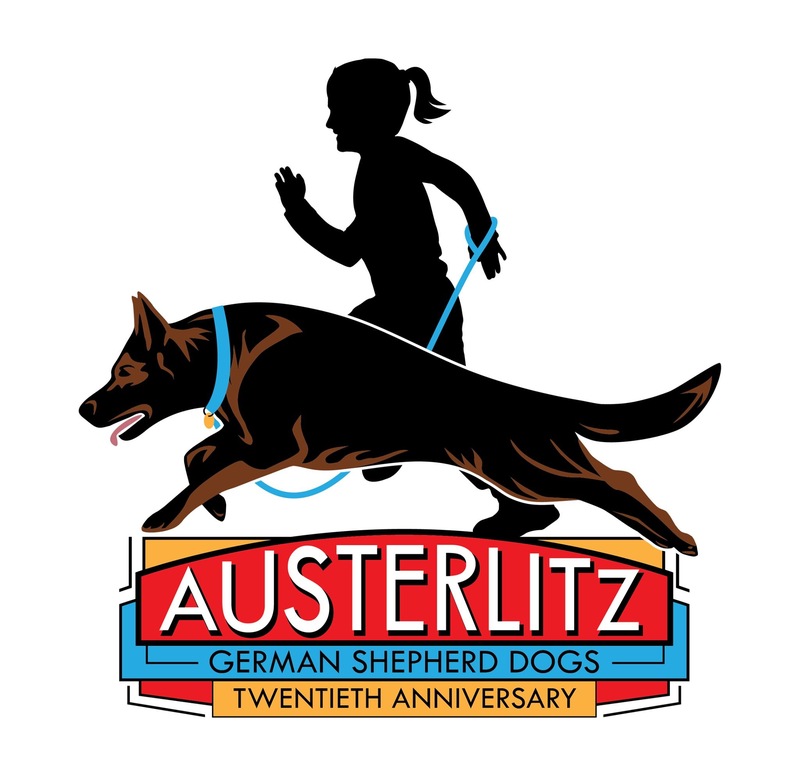 You will find your extended Austerlitz Family to be encouraging, supportive, and always ready to help you make the most of your life with your Austerlitz Shepherd. We are always available via SM, text, email, or phone to provide any support we can as you raise and live with your dog. Ongoing Support: Even more support and information is available through our blog, both on our kennel website and our training website Clickety Split Dog Training You will find blogs on training, enrichment, and practical living with German Shepherds topics. Detailed Information: A Detailed Health and training record is sent home with each puppy. We follow the American Veterinary Medical Association Guidelines for worming and core vaccination. Our puppies also have at least 1 Well Puppy Examination with our veterinarian. You will receive a detailed report of all health care, as well as a detailed written report of all training and socialization. Safety: All puppies are microchipped and the lifetime enrollment is paid. All you need to do is update your puppies photo and contact information. You will receive all the information you need to update your puppy’s listing and a collar tag. AKC Registration: All puppies are registered with the American Kennel Club (Limited,) we take care of the registration process for you. The AKC will send your puppy’s registration certificate directly to your home! Your AKC Registration includes a complementary 30 day pet insurance policy. Our Passionate Puppy Raising Seminar: We want to set you, and your puppy, up for lifelong success. Before you take your puppy home you will be provided with an abundance of educational material to help you prepare for your puppy raising experience, then on Puppy Pick Up Day we continue this education by preparing a day long educational puppy raising summit for our puppy families. We will go over feeding, vaccinations, grooming, health, basic training, behavior, learning theory, management, puppy biting/mouthing, socialization, crate training, and house training in great detail. You will get to practice your training on our fabulous and skilled demo dogs, and then with your own puppy. You will learn how to teach your puppy to love grooming, and how to trim nails and clean ears. While we are flexible with scheduling, attendance at our educational summit is both free (lunch included) and required of all new puppy families. 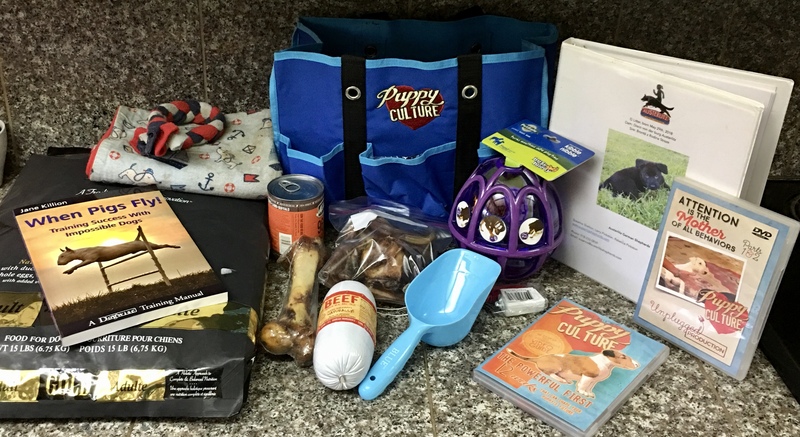 Your puppy will also be sent home with our Amazing and Audacious Austerlitz Puppy Jump Start Kit Each item is expertly curated to help set your puppy up for success during it’s transition to your new home, and to give you the tools you need to be successful raising your puppy. DVD or VOD: Puppy Culture: Attention is the Mother of all Behavior. 1# Happy Howie training bait and a clicker. Membership: a 12 month membership in Passionate Puppy Rasing FB Group. Behind The Scenes It’s not only our commitment to raising the best puppies possible that sets us apart. Our dedication to upholding the highest standards in our breeding program extends to everything we do, and every choice we make . A legacy breeding program that spans twenty years, and up to five generations, of our own breeding. We are proud our program is solid and produces a consistent physical and behavioral type that is balanced, moderate, and correct to the breed standard. Health Testing: We perform all German Shepherd Dog Club of America recommended health testing. Further, our commitment to health and longevity extends from our first litter, to our 50th and beyond. We have consistently bred for robust health, using all breeding protocols and methods recommended by the Orthopedic Foundation For Animals. Our program has focused on selecting for longevity and health by including an abundance of dogs who were active, healthy, and producing, even as seniors. Education: Our dedication to continuing education sets us apart from other GSD breeders. Susanne is a credentialed Certified Professional Dog Trainer, Knowledge Assessed. Rebecca Pinkston is currently training professionally, and is fully qualified to credential in the spring. Both Susanne and Rebecca know that the best breeders never stop learning, and both are dedicated to continuing education. Susanne and Rebecca have accrued over 100 hours each in continuing education just in 2018, from speaking at, and attending, the first Puppy Culture Breeder Symposium, to Clicker Expo Cincinnati, to online classes, seminars and workshops. At Austerlitz Shepherd education is always ongoing. At Austerlitz Shepherds we work hard to set ourselves apart from the pack. We work tirelessly, and devote ourselves to producing the best puppies possible, raising puppies to be the best they can be, and finding people are are just as passionate about their dogs as we are to give them the most amazing home possible.